American author and Baltimore native Mignon McLaughlin (1913–1983) once wrote, “Spring, summer, and fall fill us with hope; winter alone reminds us of the human condition.” This adage may support why winter is a popular subject for artists. 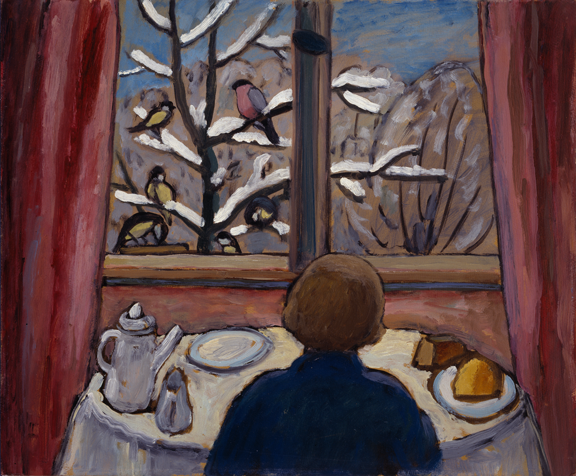 Two works in NMWA’s collection, Gabriele Münter’s Breakfast of the Birds (1934) and Joan Mitchell’s Sale Neige (1980), explore the depths of the season, eschewing comforting images of winter wonderlands to encourage deep contemplation. Growing up in Berlin, German artist Gabriele Münter (1877–1962) was no stranger to harsh winters. Working in an expressionist style, she incorporated dense layers of paint, flattened forms, and bold black outlines in her works. In Breakfast of the Birds, a woman eating alone gazes out toward a snowy scene of birds sitting in the trees. The drapes and window frame strictly divide the space into interior and exterior. The woman’s concealed face adds an element of ambiguity. Obscured, it is difficult to determine whether the central figure enjoys the solitary moment or feels isolated. The work’s title implies that the woman is joined by the birds, and that they share a meal, separated by a thick pane of glass. Münter’s tendency to compress space and distort perspective gives the work a slight alienating, claustrophobic feeling. Outside, the birds perch on snow-covered branches, free to come and go as they please. Sale Neige, meaning “dirty snow” in French, represents just that. Abstract Expressionist painter Joan Mitchell (1925–1992) blanketed the canvas with a thick additions of paint—giving the work a complex, layered surface texture. Toward the top of the composition, the artist’s sweeping brushstrokes become more elongated in shades of white, periwinkle, and violet. Gradually, the strokes appear shorter and more condensed in darker shades of indigo, royal blue, orchid, and black. Mitchell’s color choices and active brushstrokes evoke a city after a snowstorm—particularly when snow melts and mixes with mud, asphalt, and bits of refuse. The painting’s large scale contributes to its powerful presence. 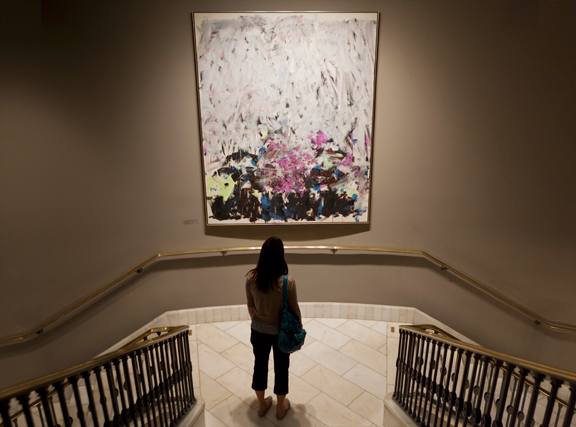 Filling the visual field, the painting engulfs the viewer in its swirling storm. Sale Neige embodies the chaos of a blizzard while also encapsulating its icy beauty. The psychology of winter is paradoxical. The season signals holiday warmth and cheer, but is also emblematic of harsh weather, isolation, and loneliness. However, through its representations, artists can channel the resiliency and spark of the human spirit. As the days grow colder, spend time contemplating winter in NMWA’s galleries through Gabriele Münter’s Breakfast of the Birds and Joan Mitchell’s Sale Neige. —Marina MacLatchie was the fall 2015 education and digital engagement intern at the National Museum of Women in the Arts.